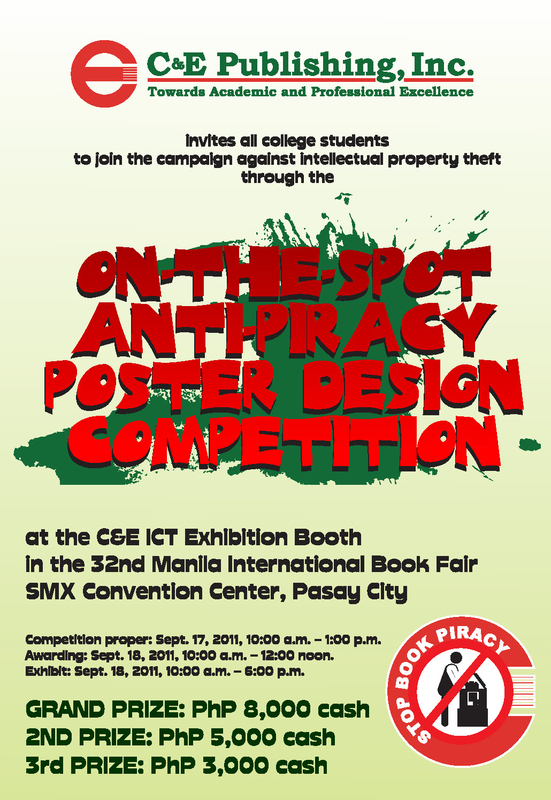 Join C&E Publishing’s anti-book piracy on-the-spot poster making contest this Sept. 17! Fight for Intellectual Property Rights and Win Cash! Are you ready to fight for intellectual property rights through art, just as the great Juan Luna fought for freedom through his work? If you are, then C&E Publishing, Inc. has the perfect opportunity for you. Express your anti-piracy message in the most compelling and artistic poster that you can create, and get a chance to win cash prizes, at C&E Publishing’s On-the-spot Anti-piracy Poster Design Competition. The competition proper will happen on September 17, 10:00 AM to 1:00 PM, at the C&E ICT Exhibition Booth; while awarding will be on September 18, from 10:00 AM to 12:00 noon. Exhibition of works will follow right after. To join, simply email socialmedia@cebookshop.com with the following: five (5) jpeg images of your sample drawings, a scanned copy of a valid school ID, and your full name, address, and phone number. Remember to put “POSTER DESIGN CONTEST” as your e-mail subject header. Hurry! The deadline for submission of the aforementioned requirements is at 12:00 noon on Monday, September 12, 2011. The32ndMIBFwill run from September 14 to 18, 2011 at the SMX Convention Center, Mall of Asia Complex, Pasay City. Join C&E Publishing's on-the-spot poster making contest and win fabolous cash prizes! Competition is open to High School and College students. All emails must have “POSTER DESIGN CONTEST” in the subject header, in order to be accepted. 4. Out of all initial contest applications, twenty (20) will be selected for the competition. Contestants who qualify will be notified via email and phone not later than Wednesday, September 14, 2011. Contestants must report for the contest proper on Saturday, September 17, 2011, at 10:00 a.m., at the C&E ICT Exhibition Booth in the 32nd Manila International Book Fair at the SMX Convention Center, Pasay City. A valid school ID must be presented by each contestant. Finalists will shoulder their own MIBF entrance fees. All registered contestants will have three (3) hours, from 10:00 a.m. until 1:00 p.m. to conceptualize and execute their best poster design. All entries must be submitted by 1:00 p.m., whether finished or unfinished. Each entry must convey a message intended to discourage people from engaging in book piracy (or the unauthorized reproduction or photocopying of any copyrighted material, in whole or in part). Contestants may use words, images or a combination of both, to convey their message. All entries must be created on 1/4 (15 in x 20 in) illustration board, in portrait layout. Contestants may use any medium (e.g., charcoal, pen & ink, oil pastel, colored pencil, colored markers, etc. ), except all types of paint (e.g., water color, oil, acrylic, etc.). All artworks must be entirely free-hand (i.e., created without the aid of computers); the use of cut-outs and collages is also prohibited. All materials (i.e., illustration board, drawing & coloring materials, etc.) are care of the contestants. a. ORIGINALITY OF CONCEPT (30%) – the degree to which the artwork presents a unique approach to the issue of book piracy, and presents a compelling reason for stopping book piracy. CLARITY OF MESSAGE (25%) – the degree to which the artwork is able to deliver its message at a glance, without the need for any verbal or written explanation. c. CRAFTMANSHIP (20%) – the quality of style and technique in creating the artwork. OVERALL IMPACT (25%) – the degree to which the artwork catches the viewer’s attention and creates recall. 16. All entries will remain on exhibit at the C&E booth until 6:00 p.m. of Sunday, September 18, 2011. All competition entries are the property of C&E Publishing, Inc.; C&E Publishing reserves the right to use or adopt any of the artworks for any purpose, without the contestant’s permission.